Hatton Adventure World to host brand new Circus Show! Hatton Adventure World is to host a brand new spectacular Circus Show during the February half term. "Big Top Bonanza" will return from 17 - 25 February and feature an international cast of comical clowns, amazing acrobats, champion jugglers and awesome aerialist's. Visitors can sit back and enjoy a 40 minute show from the magical world of the circus from inside the warmth of a large heated 400 seater big top. Visitors can also enjoy circus themed arts and crafts as well as indoor falconry. In addition there will be the usual Hatton favourites with Animal Handling, Funfair Rides (for younger children), Laser Combat (8 years +) and thrills and spills for all in Snorty's Superslide Mania. Carron Smith, Marketing Manager at Hatton Adventure World said "We are delighted to be hosting our new Circus Show which was incredibly popular last year and a real treat for all the family. Under the cover of the heated big top, our circus will be a great way to keep children of all ages entertained whatever the weather!" 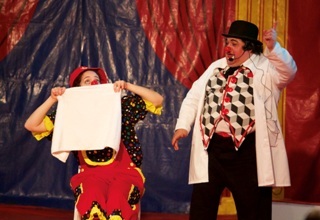 Visitors can book their circus show times online at http://www.hattonworld.com. Tickets are available now with an early booking online discount. Hatton Adventure World is open every day throughout the year (excluding Christmas Day and Boxing Day) from 10am to 5.30pm. For more information please visit the website at http://www.hattonworld.com/adventure-world or telephone 01926 843411.